Do you go nuts for Christmas decorations? This Christmas season Americans will spend about $6 billion on decorations. Science proves that decorations send a message to our brains, telling us to be happy. The sight of snowflakes and garland causes your body to release dopamine, a feel-good hormone. A combination of pretty visuals, family, and feelings of nostalgia make Christmas time a joyous occasion. However, if you’re not careful, you’ll find yourself in tears when the holidays are over. After you take down your decorations, you could be left with ugly holes and marks all over your house. That’s because installing decorations with screws and staples can cause permanent damage to your walls, windows, and doors. 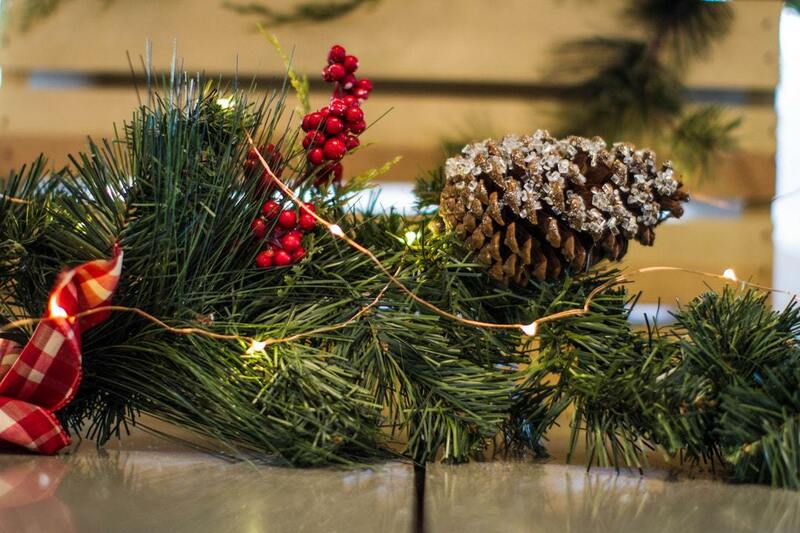 Read on to learn about creative solutions for hanging decorations without damaging your house. Remember, decorating is a fun and creative activity and it’s okay to color outside the lines. In other words, have fun and don’t worry about making everything look perfect. Allow your personal sense of fashion and style to shine through in your Christmas displays. Next, we’ll explore how you can decorate your windows without causing any damage. Make your house burst with holiday cheer by making your windows sparkle. You can safely decorate windows using fishing line and tree ornaments. In order to hang the ornaments, you’ll need the windows to have a curtain rod without a curtain on it. Next, you’ll need to cut different lengths of the fishing line. Having different lengths will help make the display be playful instead of uniform and rigid. Once you have a few pieces of fishing line cut, you can tie each piece to an ornament. After the ornaments are securely tied on, you can attach the strings to the curtain rod. Loop the fishing line over the road and bring the string back through the ornament and tie it off. One great idea is to remove your screen before hanging up the ornaments. Not having a screen will help people enjoy your display from the outside. Once the display is in place, you’ll be able to appreciate why you cut the fishing line into different lengths. The fishing line allows your ornaments to appear as if they’re floating in the air. Have fun to decorate your windows by using different techniques. Instead of stringing the ornaments up with an invisible fishing line, you add color by hanging them with red or green strings. Alternating ornaments between green, red, and gold colored strings can help create a festive appearance. If you have blinds or shutters, it’ll be a little more tricky to decorate your windows. Instead, you can try adding Christmas cheer to your walls. Our next arts and crafts project will show you how to use clothespins to decorate any interior wall. Clothespins are a celebrity in the world of arts and crafts. There’s no end to the number of creative projects you can complete simply by using clothespins. Make sure that the wall hooks you purchase have an adhesive that won’t hurt the paint on your wall. Start by cleaning off the section of wall you’ll be attaching the hooks too. After you clean and dry the wall you can attach your hooks. It’s a good idea to have the hooks rest slightly above your eye level. Now that you’re hooks are in place you’ll need to cut a piece of string or fishing line. Tie your fishing line tightly to the first hook and unravel the string until you reach the second hook. Cut the string at a length that will allow it to hang slightly from hook to hook. After you cut the string you’ll tie the loose end securely to the second hook. Now you can take your clothespins and decorations out. Thin, lightweight decorations will work best for this project. Use the clothespin to attach your first decoration to the string. Then repeat the process until every decoration you want on your string is in place. Outdoor garlands will transform your porch for the holidays. An outdoor garland is a tasteful addition to any type of holiday-themed house. The tasteful evergreen roping will work especially well if you want to create a traditional-style Christmas. The heaviness of your garland will determine the best way to hang it on your front door. If you have a lightweight garland you can hang it up using small adhesive ceiling hooks. Stay away from any hooks that require you to predrill a hole. Instead, only use hooks that have an adhesive that won’t damage the paint on your door. First, you’ll need to clean off your door and wipe the surface completely dry. Once the door is clean you can adhere the ceiling hooks. Start with two hooks, placing one on the top of your door and one on the bottom. Next, you’ll need to wrap one end of the garland around the top hook several times. With the garland secured to the top hook, you can now secure the other end to the bottom hook. Step back to see if the garland is parallel to your door. If it is parallel to your door you can repeat the process on the other side. If you want you can also add two hooks to the top of your doorway to hang a horizontal piece of garland. You can help keep the garland in place by tying it to any existing downspouts in your doorway. If you don’t have any downspouts or your garland is very thick, you’ll need to use larger ceiling hooks. Now you can start safely hanging decorations! Stouffville Glass would love to help you transform your home. With over 33 years of experience, our company has built a reputation for excellence. We take pride in providing homeowners with quality renovations for doors, windows, mirrors, and glass. Are you looking for replacement windows to help keep your house warm this winter? Or maybe you want to increase the resale value of your home with a brand new door? Contact us today and let us know how we can help. We look forward to being able to serve you on your next home improvement project.